Every day, everyone is affected by agronomy. The food you eat, the coffee you drink, the ethanol-based gas in your car, the grass on the golf course, the natural fibers of the clothing you wear—all are products of agronomy and the work of agronomists.Agronomy looks at agriculture from an integrated, holistic perspective. Agronomists are specialists in crop and soil science, as well as ecology.Food crops, in agronomic terms, are different from feed crops (see below). They are the crops we are most used to seeing in produce sections, as well as vegetable- and grain-based processed foods (oils, starches, proteins, and flours). Every day, everyone is affected by agronomy. The food you eat, the coffee you drink, the ethanol-based gas in your car, the grass on the golf course, the natural fibers of the clothing you wear—all are products of agronomy and the work of agronomists. Agronomy is a science and a practice that looks at agriculture from an integrated, holistic perspective. In agronomy, it’s important to understand the properties of the soil and how the soil interacts with the growing crop; what nutrients (fertilizers) the crop needs and when and how to apply these nutrients; the ways that crops grow and develop; how climate and other environmental factors affect the crop at all stages; and how best to control weeds, insects, fungi, and other crop pests. If that weren't enough, another huge consideration in agronomy is how to grow crops effectively and profitably while conserving natural resources and protecting the environment. In short, growing crops requires collaborations among many, many fields, including the traditional soil, plant, and weed sciences, as well as related disciplines such as ecology, entomology, climatology, and economics. The best crop production methods are always grounded in scientific research. As a result, they are by nature continually evolving and improving. Agronomists are plant and soil scientists who develop innovative farm practices and technologies that not only boost crop yields but also control pests and weeds and protect the environment. Agronomists are also professional practitioners, educators, and advisers who work directly with farmers, companies, and others in the ag community to implement the latest methods and tools for growing crops profitably and sustainably. But the reach of agronomists and agronomy doesn’t end on the farm. Agronomists also play critical roles in issues of global concern, including food and water security, air quality and climate change, soil loss and degradation, health and nutrition, and many others. Sustainable agriculture is often associated with natural or organic farming, and it is indeed related to those farming systems. But sustainable agriculture is also grounded in a great deal of research and scientific knowledge, including knowledge of the interactions between crops and soils; the nutrient and water needs of crops; and handling of crop pests. One approach to sustainable agriculture is the practice of precision agriculture: an information technology-based management system that uses data obtained from global positioning systems (GPS), and integrates the data into global information systems (GIS). These new spatial, or geographic, tools are used with yield, rate, and other information to better manage the timing and application of fertilizers—thereby reducing the impact on the environment and increasing cost effectiveness for farmers. Sustainable agriculture encompasses a number of other technologies, as well, including integrated pest management, agro-forestry systems, cover crops and green manures, and crop residue management in no-tillage or reduced-tillage systems. Farmers who practice sustainable agriculture also exploit biological processes to improve nitrogen cycling, soil carbon storage and soil health, and pest and weed management. Proper management of all of these factors produces optimal yields with minimal economic cost and environmental impact. Organic farming is a production system for growing crops that avoids the use of most man-made fertilizers and pesticides, applications of sewage sludge, genetic engineering, and radiation. In their place, animal manure, crop rotation, traditional plant breeding, and other materials and strategies are used to maintain economic crop yields, manage pests, and preserve environmental quality. Organic farming has been one of the fastest growing sectors within production agriculture in the USA and several other industrialized countries, and there is little indication that the demand for food grown organically will decline anytime soon. Organic farming advocates claim that growing crops without man-made agricultural chemicals and using production strategies that consider a holistic, systems-based management approach results in food that is healthier to eat and an environment that is safer to live in. Those skeptical of organic farming methods suggest that there is little evidence that foods are healthier when grown organically, or that man-made fertilizers and pesticides pose a significant threat to the environment when used correctly. Further, organic farming critics claim that the only way farmers can feed the growing human population in the future is by using man-made agricultural chemicals and growing genetically engineered crops when available. Only limited research on organic farming has occurred in the USA and other industrial countries in the last several decades. This is beginning to change as more agronomists and other scientists are studying organic farming methods. More will be learned about the advantages and disadvantages of organic farming compared with other crop production methods as additional research and well-designed scientific experiments are completed. In the meantime, organic farming will continue to be a frequent topic of debate by those supporting and those opposing this increasingly popular crop production method. There are many kinds of crops, including agronomic crops, feed crops, fuel crops, vegetable crops, and others. Agronomic crops are typically grown for grain to feed people and livestock, or are processed into products, such as oil, starch, protein, and flour. Major agronomic crops in the United States include corn (grown for animal feed, ethanol, and processing), soybeans, wheat, hay (alfalfa, and legume and grass mixtures), rice, peanuts, and cotton. Feed crops are grown specifically to meet the nutritional needs of livestock. They include “small grains” such as wheat, oats, barley, and rice, as well as taller grain crops like corn and sorghum. Hay crops are cut while still green, allowed to dry in the field, and then processed and stored before being fed to livestock. Silage crops are harvested in a green, succulent condition and then stored under oxygen-deprived conditions, where controlled fermentation breaks down plant sugars to organic acids, especially lactic acid. Green chop is cut, harvested, and fed to livestock while still green and wet. Energy crops are harvested for processing into biofuels, such as ethanol and biodiesel, which are being developed as alternatives to fossil fuels. Sugar-based biofuels, such as ethanol, are made from the fermentation of plant sugars. Major sources of these sugars include sugar cane (grown widely in Brazil) and corn grain (United States). Other sources include wheat, barley, rice, grain sorghum and sweet sorghum, as well as sugar beets. Cellulosic biofuels: Much research is being conducted today on ways to make biofuels from fibrous, or cellulosic, plant materials such as corn stalks, hay, and wood pulp. These materials contain large amounts of a complex plant molecule called cellulose, which can be broken down into sugar and then fermented to ethanol. Biodiesel, in contrast, is commonly produced from vegetable oil, making any plant that produces oil a potential source of energy. Common sources of biodiesel include rapeseed, sunflower, soybean, and palm; others are peanut and camelina. Peanut oil was actually the first biodiesel burned in Adolf Diesel’s new engine in 1913. Many people envision that vegetable crops are grown on small farms, for farmers markets. In reality, most vegetables are grown on large, specialized farms with many custom-designed pieces of machinery to help ease the labor. 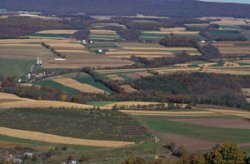 Many fields may cover hundreds of acres, and farms may be spread over several states to help insure a steady supply of fresh produce to the market. In the United States, major vegetable crops include lettuce, peppers, tomatoes, squash, sweet corn, green beans and watermelon (watermelon is included here as it is grown like a row crop, on the ground).